The fastest man in the world, Usain Bolt alongside Jamaican 4×100 metres relay team have been formally stripped of their Beijing 2008 Olympic gold medal after the disqualification of Nesta Carter for doping. 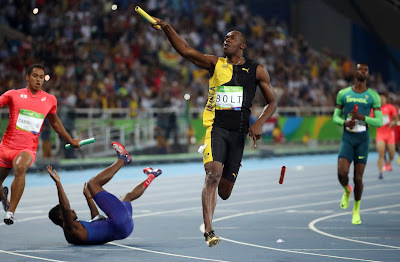 The decision, announced by the International Olympic Committee (IOC) today, means that sprinting supremo Bolt loses the “triple triple” of gold medals won across the Beijing, London and Rio Games. Re-analysis of frozen samples submitted by Carter resulted in a positive test for banned stimulant methylhexaneamine: a substance that was indirectly but not specifically on the World Anti-Doping Agency (WADA) Prohibited list at the time. Trinidad and Tobago will now be promoted to the gold medal position. Japan will take the silver medal and Brazil the bronze. “The Jamaican team is disqualified from the men’s 4x100m relay event,” a statement confirmed. “The corresponding medals, medallist pins and diplomas are withdrawn and shall be returned. Russia’s Tatiana Lebedeva has also been stripped of silver medals won in the long jump and triple jump events.